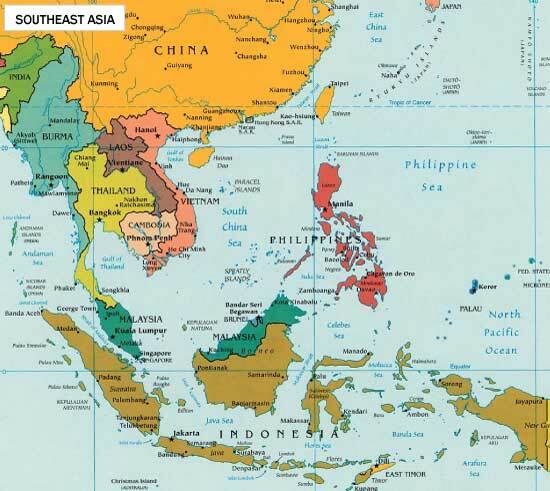 Southeast Asia (or Southeastern Asia) is a subregion of Asia, consisting of the countries that are geographically south of China, east of India and north of Australia. Brunei, East Malaysia, East Timor, Indonesia, the Philippines, and Singapore. Geographically, Southwest China, South Central China, Hong Kong, Macau, and Taiwan are sometimes grouped in the Southeast Asia subregion, although politically they are rarely grouped as such. The same is true for the Andaman and Nicobar Islands of India, and occasionally regions of the Seven Sister States such as Manipur. This page was last edited on 9 March 2011, at 00:31.